We meet at 6pm. On arrival swimmers register and take a numbered wristband. There’s a quick briefing at 6.15pm where we discuss weather and tides and make any announcements. We normally swim for just over an hour. Lifeguards in kayaks accompany our swimmers on a Tuesday session. A more informal session, we meet at 10am. Anybody is welcome but less experienced swimmers should be aware that there’s no kayak support for Sunday sessions. We still register swimmers and encourage swimmers to follow normal open water swimming safety guidelines and to buddy up. 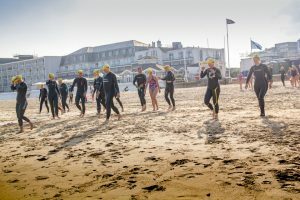 We encourage prospective members to book onto a taster session so we can assess their ability and run through some basic safety techniques. So if you’d like to join, please contact Mark Vides, our membership secretary, to book a session. We make a small charge of £3 which goes towards the hire of changing rooms, insurance and of course post swim hot drinks and biscuits. These sessions run alongside the normal club session.